Prep your bag by placing a paper bag or newspaper inside to keep the sides from sticking together. Also, cover your work surface with newspaper, a sheet or a drop cloth. Create stripes on your bag by placing tape across the front of the bag. Make sure the tape is firmly adhered to the bag so paint doesn’t bleed under the edges. Spray the bag with Peekaboo Blue. Peel off the tape and let it dry completely. When the stripes are completely dry, place tape over them while you spray the remaining striped areas in Navy Blue. Again, be sure the tape is firmly attached. Once dry, remove the tape. 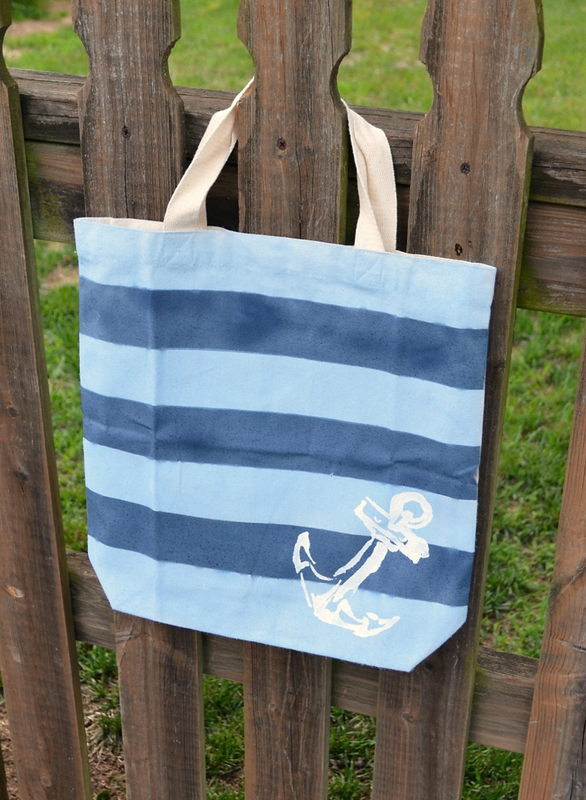 Give your bag a nautical flair by using an anchor stencil in the bottom right corner. Fill in the stencil with white fabric paint using a sponge brush. Remove the stencil and let all paint dry completely before using your bag.